The number of properties viewed online (on our company site and all of our company's agent sites) has increased dramatically over the past year. Thus, it seems that more buyers are hunting for homes. But when we compare the number of closings in the first 28 days of last March and this March, we see a rather significant decline. Will the last three days of March this year be much more exciting (in terms of closings) than the last three days of March 2009? Are a smaller percentage of potential buyers deciding to actually buy as compared to last year? Are our web sites simply more popular than they were last year, and a higher percentage of buyers are using our sites now? Will You Be Buying A New Home in Harrisonburg or Rockingham County? 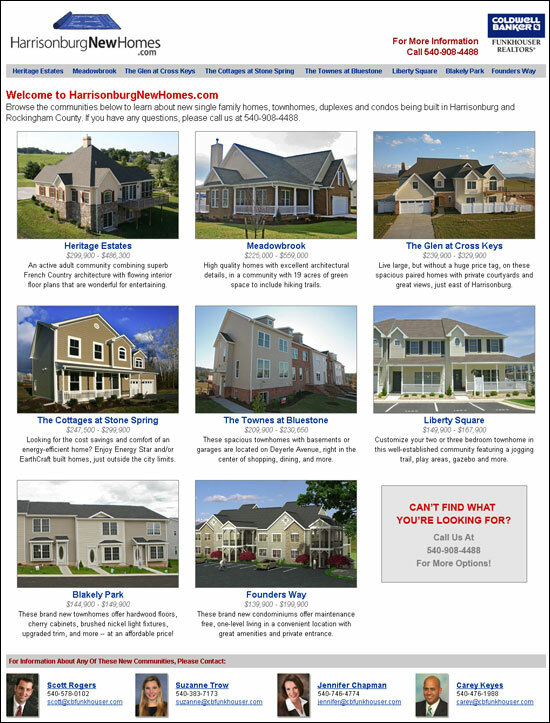 If you are considering the purchase of a new home in Harrisonburg or Rockingham County, you may want to check out HarrisonburgNewHomes.com, where you'll find an overview of many of the new communities being built in our area. In talking to a Daily News Record reporter last week I made a BOLD PREDICTION, that the local housing market would probably NOT improve this year. I felt somewhat bad about making such a prediction --- being so pessimistic! But wait --- the BOLD part was predicting that it wouldn't get any worse! So.....while I'm not predicting that our real estate market will improve this year, I also don't think it is likely to get worse. That is to say that last year there were 816 residential sales in Harrisonburg and Rockingham County, and I am predicting that the 2010 sales figure will be very close to that same number. Also of note, CBS's MoneyWatch made price predictions for all metro areas, and predicts only a 2.2% to 0.7% decline in sales price over the next year+. That would be welcome news to many in our local market who are hoping that prices do not decline any further than the small amounts that they already have. How To Close On Your Home Purchase ON TIME! It is a challenge! It seems that these days over half of home purchases don't close on time, and it is often because of delays in the financing process. Financing guidelines are much more stringent, requiring more documentation than ever before. So how CAN you close on time? Wells Fargo is confident that they can make it happen. They are so confident that they're putting their money on the line in promising to close your loan on time. The program is called the "Wells Fargo Closing Guarantee" and states that if Wells Fargo doesn't close your loan on or before the date in your sales contract, they'll pay your first month's principal and interest! Wells Fargo typically has great programs and rates, so this closing guarantee certainly boosts them up on my list of top lenders that I'd recommend that you speak with in determining where you'll obtain your financing. For financing via Wells Fargo in Harrisonburg, contact Jon Ischinger at 540-478-5223 or jonathan.ischinger@wellsfargo.com. In working with several townhome buyers over the past few months, I developed the map below outlining the main "new-ish" townhome developments in and around Harrisonburg. There are certainly other smaller and/or older subdivisions, but this map shows the location of your main options for two and three story townhomes. Take a look below the map for links to properties for sale in each subdivision. For more information about any of these townhome communities, or for any other smaller, older subdivisions, e-mail me (scott@HarrisonburgHousingToday.com) or call me at 540-578-0102. Click here or on the image below to view the full March 2010 Harrisonburg & Rockingham County Real Estate Market Report (PDF). Read on below for a few highlights. Sales held steady (no change). Prices (median) declined by 3%. Days on market held steady (no change). As can be seen below, we may be entering a new period of growth in our local real estate market. Between 2004 and 2006, the pace of sales increased steadily. Between 2006 and 2009, the pace of sales decreased drastically. 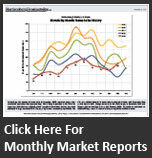 Over the past four months, we have seen the pace of sales stabilize and start to increase. Don't delay -- get all of the exciting (and not as exciting) details and beautiful charts by downloading the full March 2010 Harrisonburg & Rockingham County Real Estate Market Report (PDF). Feel free to share it with your friends or colleagues. Let me know if you'd like to meet to discuss this report and/or the particulars of your real estate situation. Let me know if you would like to schedule a time for me to come speak to your company or an organization in which you are involved. If you'd like to re-publish all or part of this information on your web site or in an article, just let me know if you need any additional information or graphics. If you'd like to know even more about the housing market in Harrisonburg and Rockingham County, click here to subscribe to HarrisonburgHousingToday by e-mail or by RSS. Though I spend a considerable amount of time analyzing our local housing market,the majority of my time is spent helping people like you buy and sell real estate. If you (or someone you know) will be buying or selling real estate sometime in the near future, I'd be delighted to have the opportunity to be of service. If At First You Do Not Sell, Reduce The Price! An amazing 31% of homes currently selling do so within 90 days of being listed. An additional 35% (for a total of 66%) sell in 3 to 6 months of being listed. Inspired by discovering that 26% of homes in the Charlottesville market have had price decreases, I thought I'd check the local stats for our market. So, it seems that 43% of homes for sale in Harrisonburg and Rockingham County have had price reductions, as compared to only 26% in the Charlottesville / Albemarle area. To put this in a bit of a historical context, when I checked the same data nearly two years ago, 40% of homes for sale had experienced a price change. OF NOTE: Our MLS simply searches for price changes, therefor some of the 368 price changes could be price increases, though it seems doubtful. "American families are going back to the future, with multiple generations shacking up together for the same reasons that young un-marrieds once did -- to save on housing costs. " "With two or three generations living under one roof, families often experience more flexible schedules, quality time with one another and can better juggle childcare and eldercare." I am definitely starting to see that trend occur, and quite a few of these buyers are ending up at The Glen at Cross Keys, where several of the floor plans work well for a multi-generational living situation. Of note, most of these scenarios are a parent and an adult child buying together, not necessarily four generations of a family as shown in the stock photography above. Click here for details on 1911 Rhianon Lane, a 5 BR, 3 BA, 3600 SF home for $329,900. Harrisonburg has steadily grown over the past ten years, and thus I would expect that we would see a gradual, steady increase of home purchases. The recent history of home sales has not followed the slow and steady theory for the last ten years. Below I have charted a gradually increasing rate of home sales (the red line) as I might expect them to be occurring. Financing guidelines were loose --- you didn't need much income, or assets, or creditworthiness to obtain a loan. You could even finance your closing costs! These relaxed financing guidelines pumped buyers into the market that otherwise would have rented. Investors were eager --- with home values escalating as quickly as they were at the time, many investors were buying properties they wouldn't have purchased in prior years when appreciation was more modest. Rapid appreciation made longstanding investors buy more properties, and created lots of new investors in the market as well. Appreciation was high --- you could buy a house one year, sell it a year later, and make money. This increased the number of buyers in the market considerably, since in the past if you were only going to stay put for a year or two, you would have rented. Financing guidelines are strict --- some would-be buyers are being turned away by lenders, as the pendulum has swung significantly past center, to where many lenders are quite hesitant to write loans unless a buyer looks perfect from credit, asset and income perspectives. This decreases the number of buyers in the market. Investors are hesitant --- with several years of (slight) depreciation in our market, and significant depreciation in other markets, most investors are hesitant to buy right now. I believe we have a lower than normal amount of investors buying residential properties right now. Appreciation is low --- with median home values dropping slightly for each of the last several years, some would-be buyers are quite hesitant to buy right now. Flat housing values at the present time mean that a buyer must stay put a bit longer in their home to have paid down their loan balance some before selling. This has decreased the number of buyers who are in the market. I believe that we will soon see an increase in the number of buyers in the market. I believe that in 2010 we will see at least as many buyers as in 2009. Only time will tell, but we may just be rounding a corner! Urban Exchange Update: Harrisonburg Lives Downtown! Less than a year ago (summer 2009) Urban Exchange opened its doors to the very first residents of this impressive new structure in downtown Harrisonburg. Urban Exchange features 194 apartments in studio, 1 bedroom, 2 bedroom, 3 bedroom and loft configurations -- with over 45 different floor plans. The big question that (nearly) everyone asked or wondered was whether there could really be several hundred people who wanted to live in downtown Harrisonburg. The results are in --- YES, there are a LOT of people who would like to live in downtown Harrisonburg! When Urban Exchange opened in summer 2009, nearly 70% of the apartments had already been leased. Per signed leases as of today, when Urban Exchange reaches one year of operation (summer 2010), over 95% of the apartments will be leased! Approximately 50% of Urban Exchange residents are "young professionals" or downtown employees. Approximately 30% of Urban Exchange residents are undergraduate or graduate students. Large contingents of Urban Exchange residents are: Rosetta Stone employees, local school teachers, and JMU and EMU faculty and staff. It certainly is exciting to see the growing enthusiasm that exists for living in downtown Harrisonburg. Most experts in downtown revitalization would agree that a growing downtown population is an essential part of a vibrant and sustainable downtown district. If you have questions about Urban Exchange, feel free to call or e-mail Mary Messerley at 877-548-3831 or mary@LiveUE.com. Of note -- only one of four retail spaces at Urban Exchange has been leased, but several spaces are still available. If you are interested in details, please contact Mike Hendricksen at 540-908-7528 or mike@cbcfunkhouser.com. Hardie Plank, corrugated metal, glass, bridges, lavish landscaping, seating areas, and more! This glass encased corner includes the mail room, a reading room, the gym, and The Apex. The west-facing side of Urban Exchange, visible from Main Street near Court Square. Four floors of apartments joined by a landscaped courtyard over top of double volume retail space. Western views along Water Street, looking out towards Rosetta Stone.